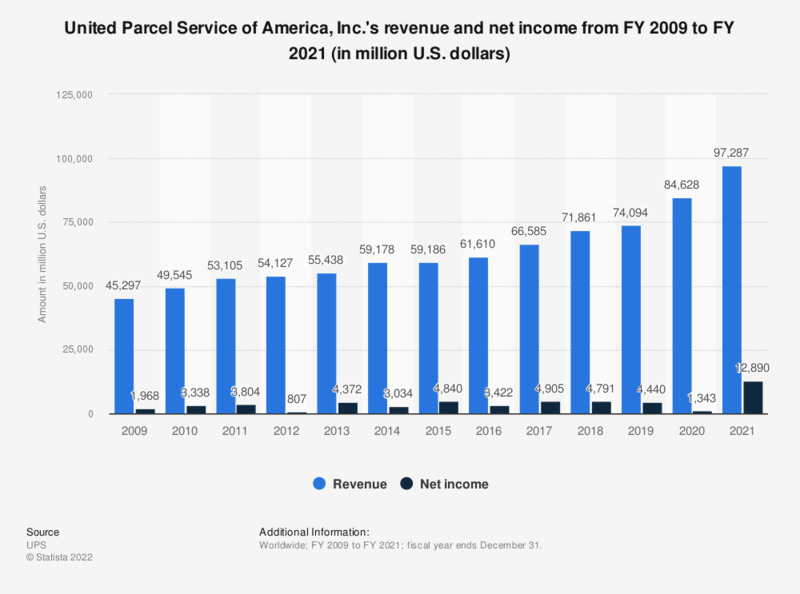 As one of the largest package delivery service companies in the world, the United Parcel Service generated 71.8 billion U.S. dollars in revenue and had a net income of about 4.8 billion in 2018. The United Parcel Service is a package delivery and supply chain management business. Although headquartered in Sandy Spring, Georgia, UPS operates in over 220 countries worldwide. Aside from domestic and international package shipments, they also deal with airline cargo and freight operations. In 2018, UPS generated about 43.6 billion U.S. dollars in revenue through their domestic package deliveries in the United States. This includes both ground and air package transportation services. Contributing to their total revenue, UPS generated around 13.8 billion U.S. dollars worldwide in their freight forwarding and truckload freight operations in that year. Between international and domestic package revenue, domestic package delivery generated more money, bringing in 43.6 billion U.S. dollars in 2018, compared to international delivery which brought in 14.4 billion U.S. dollars. The parcel market in the U.S. In 2017, UPS held the highest percentage of the market in the United States, maintaining 40 percent of it. Customer service is very important for a company to generate revenue and grow their business. In 2019, UPS had an American Customer Satisfaction Index score of 79. Their competitor, FedEx, received the same score as well, whereas U.S. Postal Service received 74. In 2017, a total of around 4.6 billion packages were delivered in the United States. Everything On "XPO Logistics Inc." in One Document: Edited and Divided into Handy Chapters. Including Detailed References. Statistics on "United Parcel Service"